Creating iPad UI wireframe with free templates and examples. Pre-built elements help you finish a high level wireframe in the easiest and fastest way. When starting the iPad design project, it's advisable to begin with a wireframe. The purpose of a wireframe is to communicate the arrangement of a page. It focus on the bone structure without getting caught up in color and design elements. Wireframes can be a big time saver as they help all parties involved on the same page. Thus, they can come to an agreement on layout of major page elements such as headers, content areas, navigation menus, and footers. The key is to get the layout nailed down so major layout changes won't take place once detailed design elements are in place. Edraw is a nifty and efficient desktop program to create wireframes, mockups or iPad UI concepts with a lovingly crafted, user-friendly interface. It is extremely easy to use and has pre-built libraries so you can get started straight away. In our iPad UI wireframe solution, you can preview and share your wireframes in various formats. The function of snap to grid and auto alignment and distribution of shapes allow for perfect placement of objects. 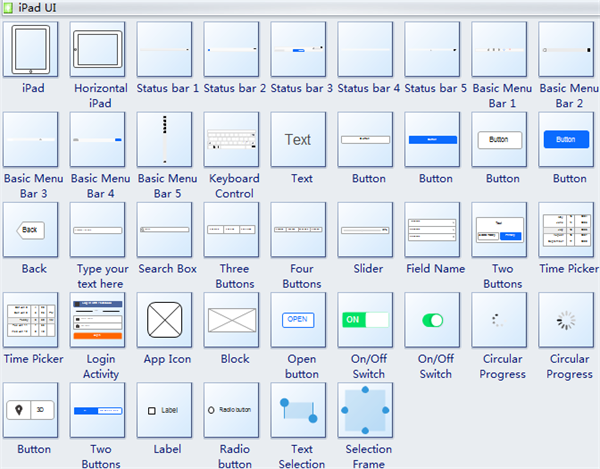 Edraw Max includes lots of specialized symbols for creating iPad UI wireframes, including Status bar, Button, App Icon and so on. They are predrawn and embedded in the program as vector format. You can easily resize, rotate and recolor each symbol. Here is a well prepared iPad wireframe example. With ready-to-use symbols and elements, this wireframe only requires less than 10 minutes to complete. Just click the picture to download it. 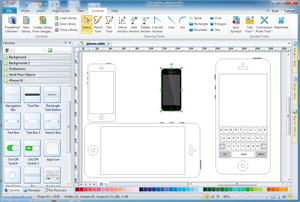 Click here to learn how to create Wireframes.